In the Bible, the olive tree is referenced about 25 times and olive oil is referenced over 160 times. The olive tree and olive oil were very important to the society in ancient Bible times. God used the olive in several different passages very intentionally and specifically. To take a closer look, it is crucial to understand the importance of agriculture within the fabric of this ancient Biblical society. Their entire lives revolved around their crops. For example, the Gezer calendar is an early table that was found in the city of Gezer, Israel in 1908. The calendar dates back to the 10th century BC, during King Solomon’s reign. The inscriptions are entirely centered around planting, tending, and harvesting crops. It has bimonthly periods with different duties in each period for the Hebrew people (Boniface). It is an important piece of evidence in understanding their culture and values. Secondly, olives are one of the three within the Mediterranean triad, along with grapes and grains. Specifically, olive oil played a critical role in the ancient world. The Israelites consumed so much of it. It is estimated that olive oil consumption per individual annually was 17-20 kg (Frick). It is often called “liquid gold.” It was a daily product that everyone used in many different ways. It was a primary source of their diet. Additionally, they used it as fuel to light their homes, cooking oil, soap making, religious ceremonies, and medicinal use. Furthermore, to produce olive oil, the Israelites used olive presses. Since olive oil was in such high demand, olive presses were everywhere throughout Israel. They are easy to dig up and uncover because they have durable remains that have persisted over time in the archeological world. There were many different types and models of olive presses created over time. They differed in size, infrastructure, capacity, and method of operation. The press was a tool used to forcefully crush and extract the juice. The olives would sit in a basket. Then, the force of the wooden lever would push down on the stone. The oil would run off out of the basket from an outlet into the collecting vat. Then, they mixed the oil with water. After a few days, the lighter oil in the juice drifted to the top of the water. It was collected and stored in jars (“Olive Production”). The first time the olive is referenced in the Bible is found during the flood when Noah sends a dove from the ark to find land. In Genesis 8 it says, “Then he sent forth a dove from him, to see if the waters had subsided from the face of the ground. But the dove found no place to set her foot, and she returned to him to the ark, for the waters were still on the face of the whole earth. So, he put out his hand and took her and brought her into the ark with him. He waited another seven days, and again he sent forth the dove out of the ark. And the dove came back to him in the evening, and behold, in her mouth was a freshly plucked olive leaf. So, Noah knew that the waters had subsided from the earth.” Throughout the Bible, the olive proves itself again and again to be a symbol of peace. From the very beginning, God wanted to make it evident that the olive is good and a gift from the Lord. It is the first sign of new life after the flood. On the other hand, with no surprise, the seizure and destruction of the olive is a symbol of war and judgement. The olive industry was much a central and crucial part of their everyday lives, so it was a big deal when that was taken away from them. For example, in 1 Samuel 8, olive trees are specifically mentioned while Samuel brings judgement upon the kings. The Word of the Lord says, “So Samuel told all the words of the Lord to the people who were asking for a king from him. He said, “These will be the ways of the king who will reign over you: he will take your sons and appoint them to his chariots and to be his horsemen and to run before his chariots. And he will appoint for himself commanders of thousands and commanders of fifties, and some to plow his ground and to reap his harvest, and to make his implements of war and the equipment of his chariots. He will take your daughters to be perfumers and cooks and bakers. He will take the best of your fields and vineyards and olive orchards and give them to his servants.” In this passage, Samuel is cursing the kings and telling them everything God is going to take away from them. One of the things mentioned is the olive orchards. Olive trees would not have been included in the list if they weren’t crucial to the people of the time period. Another example is from the book of Isaiah. At the beginning of this book, the prophet Isaiah is coming with a message from God to curse the rebelling nation of Israel. In Isaiah 1:6, it says, “Why will you still be struck down? Why will you continue to rebel? The whole head is sick, and the whole heart faint. From the sole of the foot even to the head, there is no soundness in it, but bruises and sores and raw wounds; they are not pressed out or bound up or softened with oil.” Throughout Bible times, oil was used as medicine. So, Isaiah is saying that the wounds will not be treated with oil. They will not be softened or healed. The oil symbolizes healing and peace, and God will not give them peace because they disobeyed. The last example is from the book of Zephaniah. In the 7th century, the olive oil industry was concentrated in the kingdom of Israel, specifically in Judah and Philistia. During this period, the Biblical city of Ekron, modern day Tel Miqne, expanded over 75 acres and soon became the largest center for olive oil production. It is located between the coastal plain and the hills of the Shephelah. This area was the perfect spot for economic development. The olive presses were used to produce this olive oil that was in such high demand. In addition, it allowed them access to the Judean crops that were growing in the east hills. It has been calculated that 3,500 dunams of olive trees would have been required to make this industry run smoothly. Dunams is the unit of measurement for land from the former Turkish empire that is equal to about 900 square meters. This impressive industry would have been capable of producing 245,000 liters of olive oil each year (Welch). Only 4% of the site has been excavated, and 115 olive presses have been found in this small area. 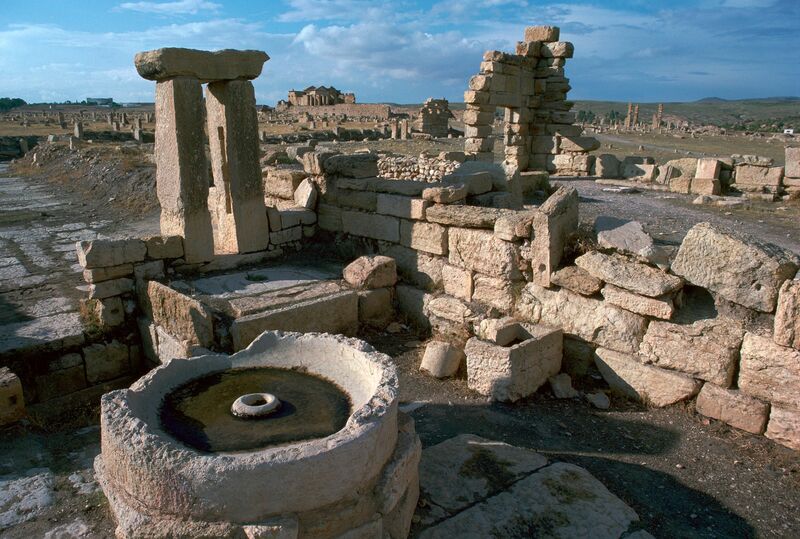 So, Ekron was the largest known ancient industrial capital for the production of olive oil, using olive presses. The olive oil industry prospered greatly in Israel (Faust). In this time period, the Assyrian empire came in and conquered most of the southern Levant in Israel. Ekron was one of those cities, and the olive oil industry was left in ruins after the Assyrian conquest (Faust). In the book of Zephaniah, it talks about the judgement and curse that God brought upon the people of Israel through the Assyrians. In Zephaniah 2:4, it says “For Gaza shall be deserted, and Ashkelon shall become a desolation; Ashdod’s people shall be driven out at noon, and Ekron shall be uprooted.” This passage is explaining the judgment from God that came upon the Israelites. It is used to portray the absolute desolation of the city. God punished them for their disobedience. The Assyrians wiped out most of the country and completely changed their way of life. The Israelites were conquered by a strong and powerful force. They no longer had security or a safe haven. The word “uprooted” is very poetic, specific, and intentionally used. To explain, the olive tree can live up to one thousand years. It is a very strong and long-lasting tree. The roots deeply imbed into the ground. In order to kill an olive tree, you can’t just cut the trunk because it will grow back. It must be ripped out of place, destroyed, and uprooted. The city of Ekron was literally uprooted because the olive oil industry was destroyed. The nation waged war and their peace was stolen from them. So, the use of the word “uproot” really paints the picture of the curse that God put on Israel and the destruction of the land. Therefore, by understanding more about olive presses and the history of the Israeli society, the different passages are so much more real and easier to understand. There is a repeating pattern of Israel rebelling and the Lord taking away. The olive and olive oil are both used throughout the Bible to help portray the contrast between war and peace. It helps distinguish between the old and new life. It is interesting how the Lord used something that was important to the people of the time period and really put deeper meaning into it. God knows all of us intimately and personally. He knows the number of hairs on our head and every single one of our thoughts. No matter what time period it is, God cares. He always has cared and always will. He is the same yesterday, today, and always. Just like God used olives to speak to the Israelites, God can use certain things in our lives to get through to us as well. He is looking out for us and always finding ways to speak to us.